2) It’s just not a problem – chill out! You won’t hear this very often from gamers, but I actually do think that there is an over-reliance on violence to sell video games. I don’t say this in a prudish, reactionary way, as I quite enjoy killing a few aliens and beating up a few comedy villains in my spare time but I just think that relatively poor games find a bigger market than they otherwise would just because they promise a certain level of violence. Violence in games has often been used to replace imagination, innovation, ingenuity and style. This is especially the case since graphical capabilities have increased the visual impact of that violence and so augmented their ability to shock. This isn’t to say that violence in games is at odds with all innovation and quality- (the excellent Bioshock is an example of an almost perfectly balanced shooter although the 18 certificate is appropriate due to some relatively disturbing scenes ) – but in games like Manhunt 2 “ultra violence” does seem to have been the complete raison d’etre and that is lazy games development if you ask me. 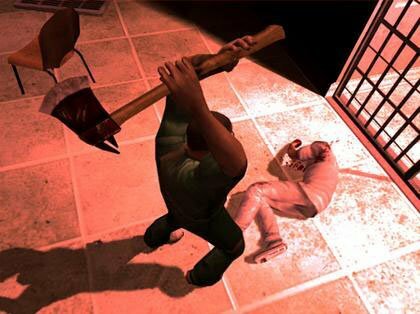 They can’t even claim some kind of tenuous artistic merit in trying to address shocking issues as they did all that in Manhunt 1, which itself wasn’t a particularly great game. My next comment was going to be that there are loads of great games over the years that haven’t used violence at all, but if you exclude sports licences and racing sims, I struggle to find many games that don’t use violence in some way. There are a few notable exceptions – Tetris, Breakout, Theme Park… but then I started to struggle. I thought “Lemmings! brilliant game, no violence in that” but then I remembered the best bit of the game – when you got stuck and couldn’t get the Lemmings out there was always the hilarious “Nuke” option, and plenty of people took it. What about Super Mario, or Sonic then? but that involves jumping on the heads of small animals, how is that not encouraging violence? Seriously though, games and sports by their very nature tap into a natural human competitive desire to win and since the dawn of civilisation games have existed as a metaphor for conflict and as an expression of how we have evolved beyond physical violence as a way of life. This is a positive thing – by enacting conflicts through the medium of game we neutralise the need to enact it in real life. So there you go, the presence of violence in videogames is something that is inevitable as the next evolution in the centuries’ old development of games. It represents a fantasy world that we have no intention of entering for real, but which highlights how far from our brutish ancestry we have evolved. It is not something to be feared or banned but frankly if games developers fail to find other hooks into their products, consumers will quickly become bored and that may be the driver that sees a wider variety of gaming genres that do not rely on gratuitous violence. In the meantime I’m going to keep killing aliens with a giant rocket launcher cos it’s fun! P.S This doesn’t cover the issue of age-based certifications. Some games are clearly not intended for children and are clearly labelled as such. It is clear that these certificates are being ignored by sales staff and parents and this is a problem. However it is not the fault of the game itself, but a wider issue to be addressed by legislation. OK, I hit 200 friends on Facebook yesterday. Initial I was pretty chuffed, but then I felt slightly embarrassed at actually being bothered about how many people have electronically linked to me on a website. I think this is the last time I’ll talk about Facebook on here. It’s pretty old news now anyway.